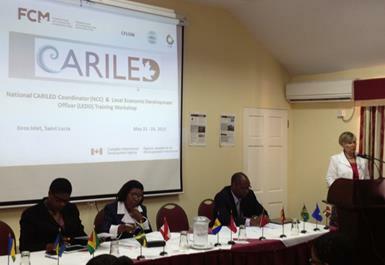 Castries, Saint Lucia: The Caribbean Local Economic Development Project (CARILED) officially opened its third training workshop on Local Economic Development (LED) in the Caribbean. The one week workshop, held from May 20 – 24, 2013, will train National CARILED Coordinators, Local Economic Development Officers and selected local government officials from 7 demonstration countries that will host projects on local economic development. Participants will learn about LED, Results Based Management for project implementation, and knowledge tools that will facilitate policy discussions, community engagement and enterprise development in 20 communities over a two year period. The training will also include study visits to a National Advisory Committee Meeting on LED and Local Economic Development Planning and Advisory Committee meetings in Gros Islet and Soufriere in Saint Lucia. Trainees include representatives from Belize, Dominica, Grenada, Guyana, Jamaica, Saint Lucia and Trinidad and Tobago. CARILED is a six year program launched in May 2012, with headquarters in Trinidad and Tobago, and sub-offices in Saint Lucia (OECS) and Ottawa, Canada. The program is being implemented by the Federation of Canadian Municipalities (FCM), in partnership with the Caribbean Association of Local Government Authorities (CALGA), the Caribbean Forum of Local Government Ministers (CFLGM) and the Commonwealth Local Government Forum (CLGF). The program, focused on local economic development projects, will eventually work in fourteen Caribbean countries and will aim to partner with 50 local government authorities to support the growth and development of 500 Micro, Small and Medium Enterprises (MSMEs). CARILED is funded by the Canadian International Development Agency (CIDA).